At least two building code inspectors are under investigation for bribery and corruption, and outside law enforcement agencies have opened cases. Public Ethics Commission Deputy Director Milad Dalju said that outside law enforcement agencies are investigating corruption in Oakland's planning and building department. The Oakland Public Ethics Commission has broadened the scope of its investigations into allegations of corruption by building code enforcement officers. In addition, outside law enforcement agencies, including the Alameda County District Attorney, are examining bribery and other potential crimes committed by building inspectors. The news that Oakland's Planning and Building Department is under investigation by law enforcement agencies, and that multiple code enforcement staff are suspected of bribery and other crimes, was disclosed by Public Ethics Commission staffers at last night's commission meeting. For years, rumors have abounded about code enforcement officers illegally extorting property owners, colluding with landlords to push out tenants, or accepting bribes and other inducements to close out code violation cases. Some building inspectors are also suspected of running contracting businesses on the side, sometimes working for property owners who are simultaneously the subject of city enforcement actions, thereby creating conflicts of interest. Last week, ethics commission investigators confirmed these suspicions when they issued a report alleging that Thomas Espinosa, a former city specialty combination inspector, received several hundred thousand dollars in bribes and other illicit payments from landlords, and that he hid these illegal payments while he was employed by the city of Oakland. Espinosa's alleged conduct went on for years, but eventually city staff blew the whistle by filing a complaint with the ethics commission. The commission's investigation of Espinosa is the most complex case it has ever undertaken; it includes 47 separate alleged violations of the city's Government Ethics Act. PEC staff are recommending that Espinosa be fined $1,151,737. Espinosa appears to be contesting the charges, however. 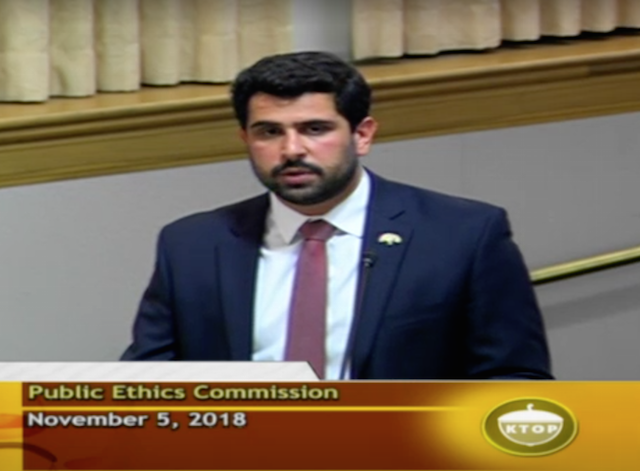 Milad Dalju, the ethics commission's deputy director, said at last night's meeting that Espinosa has declined to reach a settlement regarding the charges. As a result, the ethic commission voted to refer Espinosa's case to an administrative hearing, a process similar to a trial. When Espinosa's case is finally heard, it could include even more charges in addition to the 47 he already faces. Dalju said that since publishing the PEC report last week, the PEC has received new tips from the public, Dalju said. Dalju asked, and the commission granted, that these new allegations will be included in charges adjudicated at the upcoming hearing. When Commissioner Jodie Smith asked Dalju about another code inspector named in the report about Espinosa, it became clear that the corruption probe has widened to examine other city employees. Anthony Harbaugh, a specialty combination inspector just like Thomas Espinosa, was mentioned several times in the report as having worked with Espinosa to close out code violation cases or approve building inspections after Espinosa allegedly solicited bribes. "We opened an investigation of bribery into Mr. Harbaugh," Dalju told commissioners. "Early in this investigation we referred it to several law enforcement agencies, and have been assisting," Dalju said about Espinosa's case. Dalju specifcally named the Alameda County DA's office, but he added that federal law enforcement official have also been contacted. Several members of the public who attended last night's meeting urged the ethics commission to look deeper into Oakland's Planning and Building Department. "Expand it," Michael Taylor told the commissioners about the investigation. Taylor alleges that he was forced out of his apartment building after Espinosa allegedly colluded with his landlord, Patrick MacIntyre, to have the building improperly red-tagged. In October, the PEC opened its investigation into Espinosa and notified him of the matter. In November 2016, Interim Director of Planning and Building Darin Ranelletti sent Espinosa a letter notifying him that the city intended to fire him after an internal investigation uncovered evidence that he conspired with MacIntyre and then lied to his supervisors. That same month, Espinosa retired from the city. Earlier in the meeting, the ethics commission voted to continue, rather than close, a similar investigation into the planning and building department involving another code inspector who was accused of improperly having a building's electricity shut off. The building, a live-work warehouse located at 1919 Market Street, was inspected by code enforcement officers starting in April 2015 and city staff eventually decided the building was unsafe for habitation, so in November 2015 they sent a packet of information that included a copy of letter addressed to PG&E calling the property "unoccupied, and an attractive nuisance," and asking that utilities be shut off. Joy Newhart, who lived in the building, filed a complaint with the ethics commission, alleging that the inspector, Rich Fielding, misused city resources to help the landlord, Danny Haber, remove about 100 tenants and empty the property. She alleged that the city's request to PG&E to have the electricity shut off was illegal. On Jan. 29, 2016, the city red-tagged the building, which was empty by then, and it was later demolished. Ethics commission investigators said that they could find no violation of the city's laws because Fielding never actually sent the letter to PG&E. Rather, it was standard department practice for code enforcement to draft a letter to PG&E and send it to the landlord. Several commissioners said this practice was disturbing, even if it was department policy. They asked that the matter be investigated further for other potential violations and voted to keep the probe open.